The latest distribution of Argiope based on records received by the recording scheme is shown at Argiope bruennichi, so still rather few records for Norfolk. This is one of the species for which anyone can submit records (Wasp+Spider page, and 'save your records' link), but you need to register first. Without a reasonable picture of the spider and a good estimate of size I would not like to say what spider has made these webs. If the web is small, it could be a linyphiid (money spider) and the main hole visible is not a tubular retreat. However what little that can be seen of the spider itself in the second picture doesn't look much like the usual linyphiid suspects which make webs on lawns. If the web is made by an agelenid spider, with a sheet and tubular retreat, it presumably could be one of the 'house spider' Tegenaria species rather than Agelena, which is not normally found in the average (suburban) garden. If it was a Tegenaria species, then it would need an adult under a microscope to identify to species. I think I would lean towards the spider being a juvenile Tegenaria. 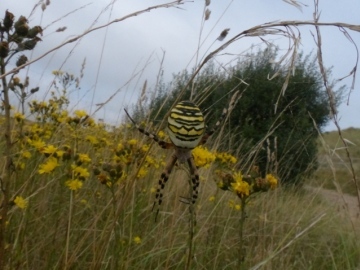 I saw a Wasp Spider at Horsey in Norfolk yesterday and have uploaded a photo. I am struggling to navigate the website and to add more details of the record. It appears still to be very rare in Norfolk? Thanks Peter very helpful. Sounds like our fellow. Best of luck. 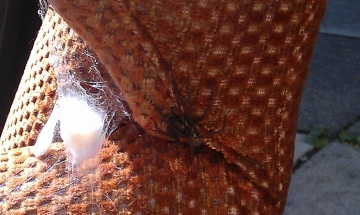 Hi Mark, your spider looks like one of the larger house spiders Tegenaria species. These can only be identified to species by microscopical examination of adults. Hi Adam, thanks for uploading the picture. With green chelicerae your spiders are certainly Segestria florentina, and I think they can probably be quite long-lived. Your record has been added to the recording scheme. Hi all, I've shared a shed with the following friendly fellow for several years now, although I suspect that's not the case and this is simply this year's specimen. I'm curious as to what type it is. 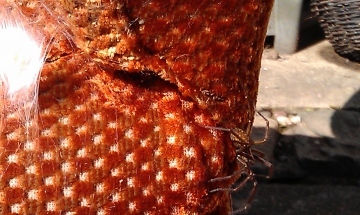 It lived on an old chair near the window in a warm wooden shed. It's difficult to determine the size but I expect it was around 20mm. I've looked through the Id pictures but can't determine which it might be. Thanks. I wish I had a better camera with me, it was a very striking specimen. Yep. I think (that could be a major qualification!) that it is a female and she looks gravid. Spiders do vary in size though and this species is variable in colour and pattern. Wolf spiders are a lot smaller. Probably this is a particularly fine specimen worth shooting and mounting on the wall. Ah ok, I see lots of Nursery Web spiders (I used to know them as Wolf spiders) on Gorse near my home, but they are generally smaller and a sandy colour with more distinct dark brown and cream stripe markings. Also the abdonmen is no wider than the body and is elongated, rather than being much wider than the body and almond shaped. What is the difference in what I am seeing? Are the ones I am used to seeing Males or non pregnant Female's with different colouration or is there something else? Intimidating B Smith? The Gorse bush it is on is a lot more intimidating!. This spider is female and is called a Nursery-web Spider. The web she is on could be hers and spun to protect her live babies inside. She looks quit fat though almost as if she has not laid her eggs but if she is on her nursery web she must have done a while ago because she carries them around in a silk ball held in her jaws for a while before they hatch. Then she spins a web around her hatching spiderlings. She sits on or near the web to protect the babies inside. 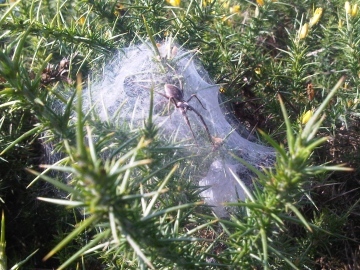 Perhaps though the web is not anything to do with her but has been spun by another large spider that is often found on gorse Agelena labyrinthica and she is just sunbathing on it. The spider is called Pisaura mirabilis and is very common in the UK. Pisaura are prettily marked in very varied patterns of light and dark browns and greys. Yes, she is quite a big spider as they go in Britain but watch out in future though because there are some bigger spiders out there! Actually she will do you no harm at all. Watch out more for prickly gorse bushes though as they can actually hurt! Hello, I came across this spider in the Peak district between Hollins Cross and Edale on the side of the footpath SK1332684636. 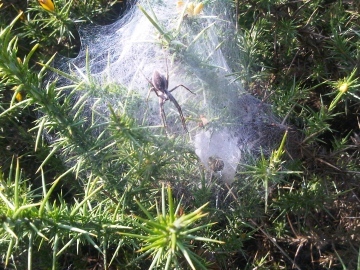 The web and spider were sitting on top of some knee height scrub vegetation (Gorse). I was a little taken aback by it's size and it looked very distincitve to me, not like anything I have seen before in the UK. The picture doesn't do it justice (I only had an old mobile phone to photo it with), especially the colours, I would describe it as grey with a darker grey-brown pattern on it's abdomen which was noticably large and almond shaped. It's legs looked thick and muscular. Body length (legs excluded) it is hard to feel accurate, but at a guess 1.5-2.5cm, it was the most intidmating looking spider I've seen in the UK. I've looked on a couple of UK spider ID sites and have found nothing that really looks like it. The picture you have uploaded named spider is one of the house spider Tegenaria species. These can't be identified to species level without microscopical examination of adults. found at home on carpet by the front door is this this common species.